Many delicious foods and beverages can stain your teeth over time. Dingy, discolored teeth can ruin your appearance, but today’s teeth whitening options can restore them to their former glory. If you’re tired of seeing discolored teeth in the mirror, our professional dental whitening services can put a smile back on your face. In-office teeth whitening, which is performed by a qualified teeth bleaching dentist, is carried out in a controlled environment to ensure patient safety and comfort as well as great results. A highly concentrated bleaching gel can produce dramatic lightening in only one office visit. Professional whitening is most effective at removing external stains caused by foods, beverages and tobacco use. If you have internal discoloration due to the use of certain medications, damaged fillings or tooth decay, bleaching won’t help. The materials used in making crowns, veneers and fillings cannot be lightened with bleach, so the whitening process may result in uneven color if you have visible restorations. Our dentists perform a thorough examination to determine the underlying causes of discoloration and formulate a treatment strategy to restore your beautiful smile. If you’re looking for a way to lighten teeth at home, our dentists can help. In addition to in-office teeth whitening procedures, we can create convenient at-home teeth whitening kits complete with custom-fitted trays and professional-strength bleaching gel. 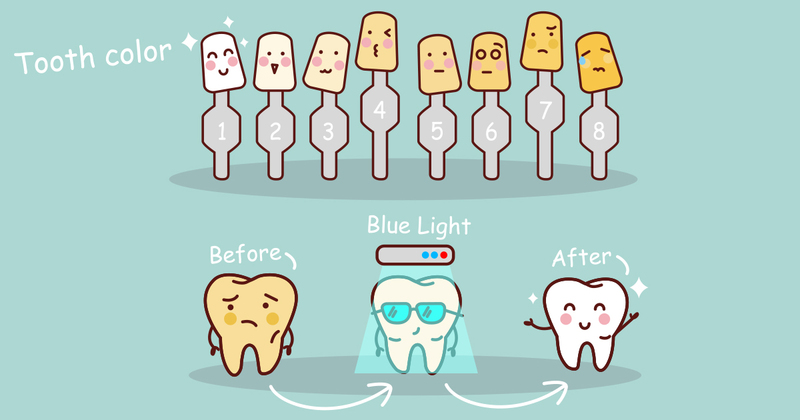 After daily use for two weeks, your teeth may be up to six shades lighter. Contact us to learn more. Several factors can influence the cost of teeth whitening, including the type of whitening system your dentist recommends and the frequency of treatments. When calculating teeth bleaching cost, it’s also important to consider the price of changes to existing restorations to ensure even color. Overall, teeth whitening is affordable and can easily fit into most budgets. Contact us to schedule an evaluation so that we can provide an estimate. A variety of teeth whitening products are available over the counter, including teeth whitening gel tray systems, strips, brush-on treatments and more. While these may whiten teeth to some degree, they don’t produce the dramatic results that you can enjoy with in-office treatments. When your dentist supervises your teeth whitening, you can expect more intense and consistent results and a lower risk of gum irritation. Before your teeth whitening procedure begins, your dentist will perform a careful evaluation of your teeth and determine the causes of any discoloration that is present. You may also receive a professional dental cleaning to remove plaque and tartar. Before applying the bleaching gel, your dentist will take pictures of your teeth to verify your results. He or she will also apply a protective coating to your gums to prevent irritation. Several applications of bleaching gel may be needed to achieve the best results. Each will be left in place for a specified amount of time and then removed so that your dentist can check your progress. In some cases, your dentist may also use a special light to enhance the effects of the whitening system. After the final gel application, your dentist will determine if you need a follow-up treatment or at-home maintenance. Has a decade of coffee stains left your smile in need of a makeover? Contact us today to explore teeth whitening in Indiana.